Yellow fever is an acute viral hemorrhagic disease caused by yellow fever virus (YFV), a prototype of the Genus Flavivirus of the family Flaviviridae. YFV probably originated in Central Africa, spread subsequently to East and West Africa, and was introduced into the Americas with the slave trade between the 16th and 19th centuries. The first recorded outbreak of Yellow fever was in Yucatan peninsula, Mexico, 1648. People first isolated the yellow fever viral from a rhesus monkey inoculated by serum samples from a patient of Ghana in 1927. Yellow fever is the first identified human virus. According to WHO report, there are an estimated 84 000–170 000 cases and up to 60 000 deaths due to yellow fever per year with about 90% of these cases occurs in Africa. • Sylvatic (or jungle) yellow fever: In tropical rainforests, monkeys, which are the primary reservoir of yellow fever, are bitten by wild mosquitoes which pass the virus on to other monkeys. Occasionally humans working or travelling in the forest are bitten by infected mosquitoes and develop yellow fever. • Intermediate yellow fever: In this type of transmission, semi-domestic mosquitoes (those that breed both in the wild and around households) infect both monkeys and people. Increased contact between people and infected mosquitoes leads to increased transmission and many separate villages in an area can develop outbreaks at the same time. This is the most common type of outbreak in Africa. • Urban yellow fever: Large epidemics occur when infected people introduce the virus into heavily populated areas with high mosquito density and where most people have little or no immunity, due to lack of vaccination. In these conditions, infected mosquitoes transmit the virus from person to person. Figure 1. Transmission cycles of yellow fever. The incubation period is 3–6 days. At the abrupt onset, the patient has fever, chills, headache, dizziness, myalgia, and backache followed by nausea, vomiting, and bradycardia (Figure 2). During this initial period, which lasts several days, the patient is viremic and a source of infection for mosquitoes. Most patients recover at this point, but in about 15% of cases, the disease progresses to a more severe form, with fever, jaundice, renal failure, and hemorrhagic manifestations. The vomitus may be black with altered blood. When the disease progresses to the severe stage (hepatorenal failure), the mortality rate is high (20% or higher), especially among young children and elderly adults. Death occurs on day 7–10 of illness. Encephalitis is rare. On the other hand, the infection may be so mild as to go unrecognized. Regardless of severity, there are no sequelae; patients either die or recover completely. Figure 2. Major symptom of yellow fever. Yellow fever virus is a positive-sense, single-stranded, ribonucleic acid (RNA) ̶ enveloped flavivirus with a diameter of about 50-60 nm. The virus is transmitted via the saliva of an infected mosquito. Local replication of the virus takes place in the skin and regional lymph nodes. The virus gains entrance through receptor-mediated endocytosis. RNA synthesis occurs in the cytoplasm and protein synthesis takes place in the endoplasmic reticulum. Virions are released through the cell membrane. 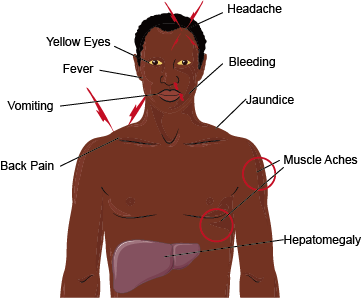 Yellow fever is difficult to diagnose, especially during the early stages. More severe disease can be confused with severe malaria, leptospirosis, viral hepatitis (especially fulminant forms), other hemorrhagic fevers, infection with other flaviviruses (e.g. dengue hemorrhagic fever), and poisoning. Blood tests (RT-PCR) can sometimes detect the virus in the early stages of the disease. In later stages of the disease, testing to identify antibodies is needed (ELISA and PRNT). Virus antigen or nucleic acid can be identified in tissue specimens using immunohistochemistry, ELISA antigen capture, or PCR tests. The virus may be recovered from the blood the first 4 days after onset or from postmortem tissue by intracerebral inoculation of mice or by use of cell lines. IgM antibodies appear during the first week of illness. The detection of IgM antibody by ELISA capture in a single sample provides a presumptive diagnosis, with confirmation by a fourfold or greater rise in titer of neutralizing antibody between acute phase and convalescent phase serum samples. Older serologic methods, such as HI, have largely been replaced by ELISA. Specific hemagglutination-inhibiting antibodies appear first followed rapidly by antibodies to other flaviviruses. Vaccination is the most important means of preventing yellow fever. Because yellow fever virus has only one single serotype, so it can be effectively prevent by vaccination. The yellow fever vaccine is safe and affordable and a single dose provides life-long protection against yellow fever disease. A booster dose of yellow fever vaccine is not needed. The risk of yellow fever transmission in urban areas can be reduced by eliminating potential mosquito breeding sites by applying larvicides to water storage containers and other places where standing water collects. Insecticide spraying to kill adult mosquitoes during urban epidemics can help reduce the number of mosquitoes, thus reducing potential sources of yellow fever transmission. 1. Heinz F X, Stiasny K. Flaviviruses and their antigenic structure[J]. Journal of Clinical Virology, 2012, 55(4): 289-295. 2. Stock N K, Laraway H, Faye O, et al. Biological and phylogenetic characteristics of yellow fever virus lineages from West Africa[J]. Journal of virology, 2013, 87(5): 2895-2907. 3. Monath T P, Vasconcelos P F C. Yellow fever[J]. Journal of Clinical Virology, 2015, 64: 160-173.